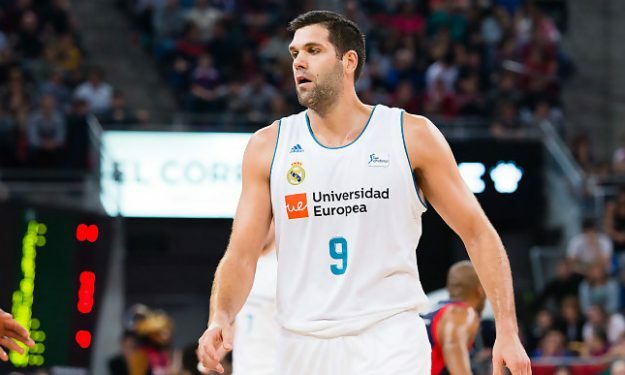 If Felipe Reyes plays in Game 3 of the Spanish League semifinals against Gran Canaria he will overtake Rafael Jofresa’s record of 756 participations in ACB. Real Madrid‘s captain and leader on and off the court is 38 years old and is still making headlines. After playing in Madrid’s Game 2 win for the Spanish League semifinals against Gran Canaria, Felipe Reyes reached Rafael Jofresa’s (Badalona, Barcelona, Girona) feat of 756 games in Liga Endesa and if coach Pablo Laso uses him in the third game of the series at Gran Canaria, Reyes would overtake Jofresa’s record. First on the list is Joan Creus (Granollers, Barcelona, Manresa) who has played in 193 national league games, and in 585 in the ACB competition, reaching a total of 778. If Felipe Reyes plays next season, he could overtake his special record.